I’m currently well into my twenties now and all these anti-aging products have all of a sudden started calling out to me. I know that my skin is both sensitive and scarred and whilst it’s currently clear of spots, I want to start working on removing the scars from having years of acne and preventing wrinkles from forming. Currently, any kind of surgery or procedure to treat my scars is not possible. I don’t have the money for it and it’s taken 12 years for my skin to be clear, so I’m not sure I’m willing to ruin it on the off chance that I react to something. So instead, I’ve turned to the high street to see what I could find. As I was browsing through my local superdrug’s skincare aisle the Nip + Fab Viper Venom Night Extreme Night Fix caught my eye. Mostly because I saw the word retinol and picked it up straight away. Retinol is the number one ingredient recommended by dermatologists to help improve fine lines and wrinkles. It is an essential part of a skin care to help collagen-depleted skin. Retinol also helps reduce pore size. The product comes in a small 50ml pot which is very lightweight. Upon opening it, I was surprised to see that the night cream was not filled to the very top but nonetheless I was ready to give it a go. The cream is an off white/almost yellow colour and the consistency is that of a watery gel which glides on to your skin beautifully. When I first put the cream on there’s a very slight tingling sensation, for me it was almost unnoticeable. I also love that the cream has a really cooling sensation on my skin. You only really need a pea sized amount to cover your whole face and I would recommend that you stick to using a minimal amount. Using more does not mean you’ll get better results with it. 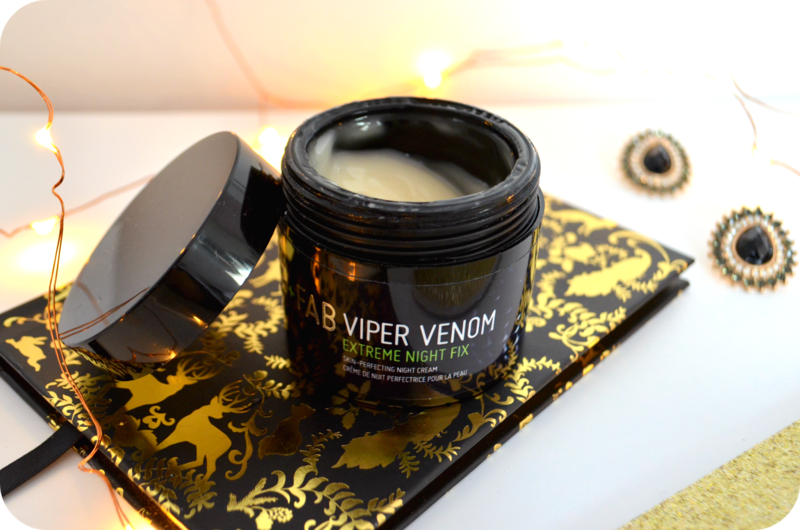 The viper venom extreme night fix doesn’t leave a sticky residue or a film so once it’s dry it’s practically soaked straight into your skin. The night cream has a strange, almost medicinal smell but in all honesty it’s not ridiculously overbearing and it does fade away after a while. The night fix does not leave my skin feeling tight or dry, in fact it’s really hydrating and if I do ever skip moisturiser at night, this will be enough to keep my skin moisturised. Sounds like a miraculous product right? 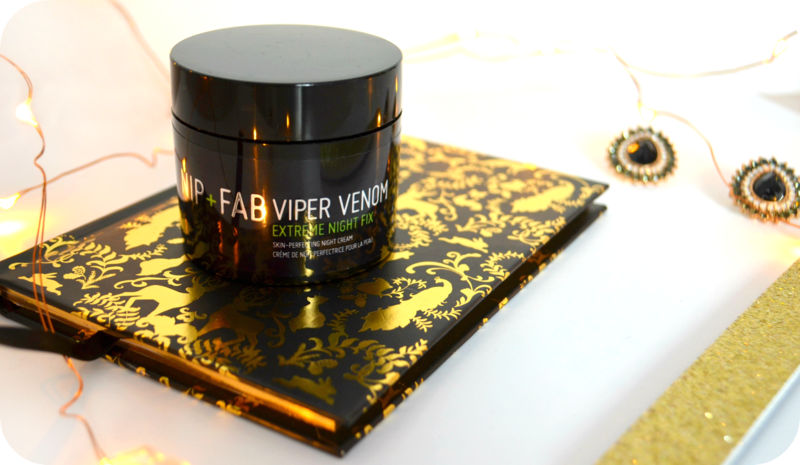 I’ve been using the viper venom extreme night fix for 2 and a half months now and it’s definitely on my repurchase list. Whilst I haven’t noticed my (humongous) pores getting any smaller, I have noticed a significant difference in my acne scarring. My old red marks have faded away, and any new marks I get fade away quicker than ever before. What I have loved the most though is that the smaller ice pick scars that I have are starting to show a slight improvement. A tiny amount mind, but still enough for me to be excited about continuing to use this product. Price at £19.95 in most stores, and £14 on ASOS (at the time of writing this review) I think it’s well worth the money. It has lasted me over 2 months of continuous use and a little goes a long way. I love that this product has provided easy access to Retinol via the high street and I surprisingly couldn’t find any faults in the product whatsoever. I’d recommend it to you all, especially if you have minor scarring from acne or are looking at early prevention of wrinkles.